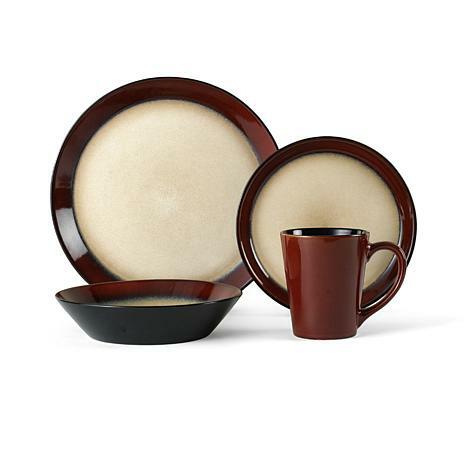 Enliven any dinner table with this traditional earth tone set accented with a complementary burst of red. Each stoneware piece is banded by a stripe that perfectly coordinates with the design and palette of the body. Food never looked so good. For us, durability is one of the most important factors. We have 3 young children and plates get broken. These have proven to be the most durable we have ever had. This set is absolutely beautiful. Although the red looks more brownish red, I love it. Glad I made this purchase. 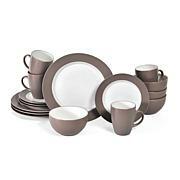 I bought this for my sister for Christmas and love the rich colors, the size of the saucers and bowls. It will grace any dining table. I haven't owned these dishes for 6 months and 4 of the plates are chipped. 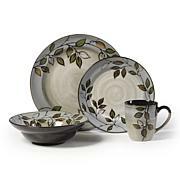 I owned a set of Corelle dishes for years and none of them chipped! 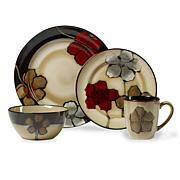 If you're looking for a durable set...this is not it although they look lovely!